I don’t know how I did it. Four kids in six years was like a tsunami of babies. Don’t get me wrong, I loved my babies. But it was a marathon of diapers and babyproofing, floor mopping and high alert as they toddled around. The inevitable head bumps and cut lips desensitized me over time. I moved from hysterically grabbing ice packs and setting alarms every two hours to check on them to throwing a bag of peas on their boo-boo as we hustled about the day. Just when we emerged out of the baby days they began to help outside on the farm. That was a whole new level of attention as I tried to teach them to stay in the tractor driver’s line of sight and how to know when to jump or hold your ground with an angry cow. It was still chaos but the boundaries were bigger as they learned to help with baling hay or feeding the goats. Then came the school days. On top of the farm chores I needed to coordinate homework and all the activities. I learned to make foil dinners for the nights on the road and the bleachers. There were times that I never stopped once the car got rolling, dropping and picking up at different playing fields, and school events. I had nightmares about forgetting a kid but it only really happened once or twice. There was a new kind of danger. They were surrounded by other kids who made bad choices and temptations. Just like those baby days when I babyproofed, I worked instead to bullyproof and teach how to deal with difficult people. “You have to finish what you start, do the right thing, if your buddy jumped off a bridge would you do it too”-words from my mother echoed out of my mouth to them as I attempted to fight the chaos that could swirl around them. It was a battle to get it all done. Who am I kidding? I never got it all done. My house was never clean enough. There was always too much clutter and a list of to dos. That could all wait. There were kids to raise and launch. Some day things would calm down and I would catch up. Some day is here. Dust settles because there are not so many feet stirring it up. The piles are still here but a lot of the contents are things I am sending to them as they begin their own round of baby raising chaos. As I watch them juggle military responsibilities and family, I look back now and wonder how I did it all. But I pressed on every day fighting the clock and the calendar buoyed by the joy that comes from being a mom. I have learned that those days of fighting small battles of too much laundry and not enough time taught me some great lessons. Just keep going. Don’t sweat the small stuff. Take some time to pray. Stay away from negative influences. Look for joy. This too shall pass. Soon another deployment will be over. People ask me how I do it with 12 deployments almost behind me now. They wonder how I can be so brave. It’s not bravery-it’s pure momma stubborness. I am going to still be on my feet, not curled in a fetal position somewhere because I am the Mom. Deployments are like having a houseful of toddlers. Danger abounds and I just have to keep going using the lessons I learned as I worked to get through each hectic day. The pride of knowing I raised kids who are making a difference helps calm the chaos of my heart. 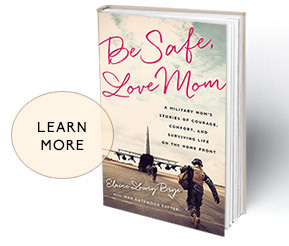 But deep down it is that stubborn momma love that gives us the strength to lift a car off our child if we have to, or be ready to welcome them home after another long visit to war. 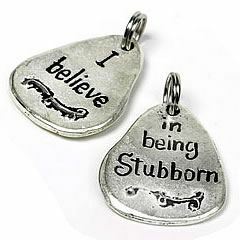 I do believe in stubborn military momma love.